Teach students how to compare and contrast while having fun! 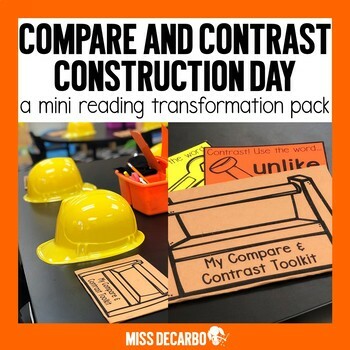 EASILY transform your classroom into a construction site theme that focuses on the skill of comparing and contrasting books, characters, events, or topics. This engaging compare and contrast pack includes a comprehension craft called a compare and contrast toolkit. Your students will use the compare and contrast tools to help guide them in their skills. 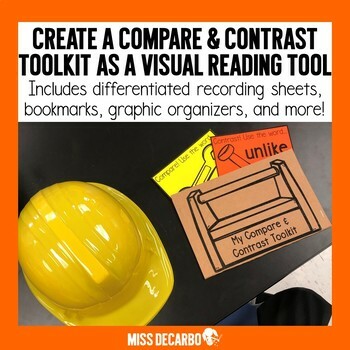 The compare and contrast toolkit craftivity can be used with ANY fiction reading passage or book for a hands-on and engaging visual! In the pack, I share the two books we compared and contrasted as a class: Little Excavator by Anna Dewdney and The Flower and The Digger, by Joseph Kuefler. (Note: You can use ANY books you'd like, too!) 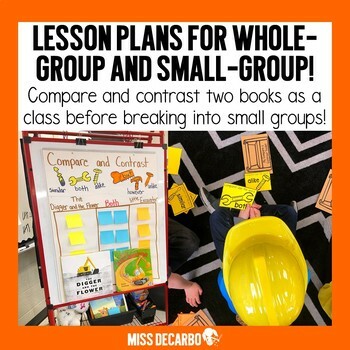 I share my whole-group lesson plans and all of my plans as we broke out into small groups and hit the job sites with our toolboxes! Pass out plastic hard hats and let the fun begin! They will LOVE it! 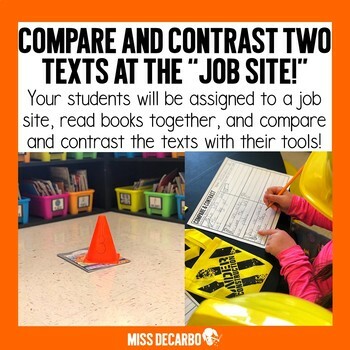 I have also included my own lesson plans of how I organized our Compare and Contrast Construction theme, included suggestions, tips, and additional ideas for your students. This pack includes additional compare and contrast graphic organizers, bookmarks, a compare and contrast sticky note organizer, tons of pictures of the work we did in my own classroom, and differentiated recording sheets so that you can cater the lessons and the templates for your class! What is included in Compare and Contrast Construction pack? Who is Compare and Contrast Construction Day designed for? Comparing and contrasting is an important comprehension skill that all readers need to develop as they read to understand. Explicit instruction in this text structure is important as readers begin to independently read nonfiction and fiction texts. I created this pack for first-grade and second-grade students. The differentiated recording sheets and templates allow you to choose the work that will best meet your students' needs. Although this pack was written for first and second grade classrooms, kindergarten teachers could easily do this with teacher-guidance as a whole-class experience! The toolkits can be used with ANY book or passage that you already have. For the small group work, I picked out books for each group to compare and contrast based on their independent reading levels. Therefore, you can use guided reading books you already have in your classroom - even if the students have previously read the books! There is nothing wrong with rereading books and reading for a new purpose! Versions of fairy tales and fables work well for the small group lessons in this pack. The toolkit cards, graphic organizers, and bookmarks are appropriate for all levels of readers! Do you have a video explanation of this pack? Can I see what some of the pages look like? Of course! Simply click on the Preview File and scroll through to get a feel for this mini-pack. Do you have other resources that are focused on compare and contrast? Do you have additional reading theme packs? If you love this pack, you'll also love Restaurant Retell Day!